Term life insurance is preferred by millions over cash value life insurance since it is the original form of life insurance and can be contrasted to permanent life insurance like whole life, universal life insurance, and variable universal life. Term life insurance guarantees coverage at fixed premiums for the lifetime of the covered individual. This is the single biggest reason why the general mass and many insurance experts recommend of this. However, there are some mistakes that you need to avoid while you decide on a particular term life policy. Here is a comprehensive list to help you make the right decision. Below are the 5 most common mistakes people make while buying term life insurance. 1) Buying a little amount just to replace income: If you are purchasing term life to replace your income, always buy 10-12 times of your income. If you get a policy that’s worth just one of your income, you are draining all your money in vain. If you are the primary source of your income in your family and something unfortunate happens to you, your spouse and kids need to be taken care for a long time. If you have the right amount of coverage, they will be able to live a decent life until they figure out a way to make it better. Again, don’t forget to get coverage for both spouses. Lifestyle costs are definitely going to soar in upcoming days and if you remain jobless for 10 long years, just try to figure out how much money would be required to secure the financial standing of your family. 2) Buying for a short tenure: You might be doing some rigorous budgeting and trying to save some dollar by choosing a shorter term coverage. But what if you purchase a 5 year policy and you experience a health issue just after 5 years from now? You won’t get a single penny from your coverage because it’ll be lapsed by that time and all the premiums that you’ll pay over the next 5 years, will go in vain. So how long should buy for? Experts say that the tenure should base on when your kids becomes self dependent. 3) Waiting too long to be covered: If you wait too long before purchasing a term insurance policy, you are just leaving your family vulnerable in case something unfortunate happens to you. Suppose you are taking too much time to decide if to get one or not. Term life insurance premiums are high for aged people. So purchasing sooner is a wiser decision. Many people overlook it while they are young and healthy and denies the need of a life insurance policy. Often many people wait until their debts are cleared. All these just increase the vulnerability and the premiums. 4) Purchasing too many riders: Some people start buying too many riders to give some additional layers of protection to their family. By doing this they pay much more than what is actually required. Some of the most enticing riders include income replacement, critical illness & accidental death, and waiver of premium. Some emotionally charged people start adding up these riders but the return they offer is very little. 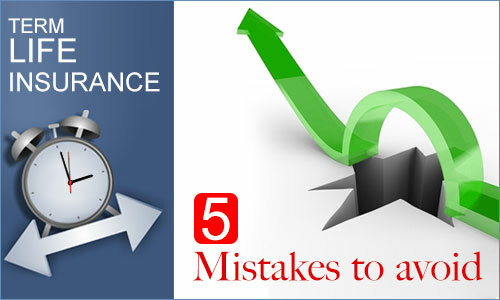 5) Failing to review your life insurance policy: It’s always a wise idea to review your life insurance policy from time to time to make sure you have exactly what your current situation needs. You coverage might suit your needs perfectly 5 years back, but that doesn’t mean it will work perfectly for you now. Make sure you have enough insurance to support your ever changing needs. What if you have a child, buy a new home, or have some health issues? These essential life events can require additional coverage at anytime. Getting life insurance is very significant for a healthy financial plan. If you just drop the idea of getting a term life insurance, you will find yourself in a huge financial hole one day.